Here at D & D Motors, Inc., we understand attending college is not cheap. That’s why we are proud to offer our incredible College Student Purchase Program to help college students or recent graduates get behind the wheel of a new Ford model for less. If you are currently attending college or have recently graduated, you may be eligible for a $500 incentive, plus fantastic rates through Ford Credit when you purchase or lease a new Ford vehicle here at our dealership. Check out the program requirements below to see if you qualify for this spectacular opportunity! Undergraduate student is enrolled full-time OR part-time at an accredited Four-Year College/University, Junior College, Community College, or Trade School (Student must be enrolled in a minimum of 2 classes or an equivalent of 6 credit hours during the semester prior to the sale date, the current semester and/or the semester following the sale date) and is considered by the schools guidelines to be in “good academic standing” (academic standing may be noted on the student’s term grade report). 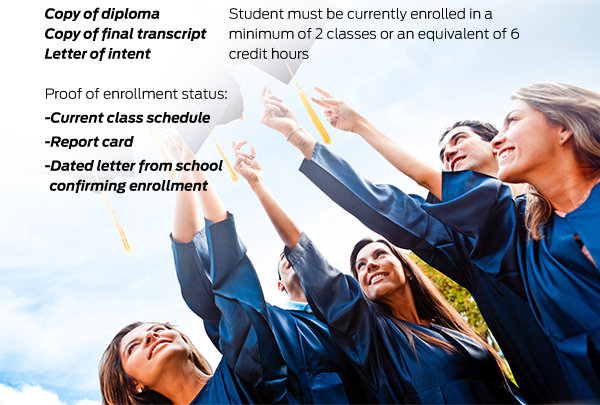 Student has graduated or will graduate between May 1, 2014 through January 2, 2019 (Student must have completed all requirements for graduation to qualify using an anticipated or future graduation date). Student is currently enrolled in an accredited Graduate School program (Student must be enrolled in a minimum of 1 class or an equivalent of 3 credit hours during the semester prior to the sale date, the current semester and/or the semester following the sale date). *NOTE: One-course completion certificates, on-the-job training courses (i.e. sales training, teaching certificates, professional designations and adult education courses), English as a second language courses, internships, apprenticeships and residencies do not qualify. Model year 16/17/18 vehicles are eligible. See dealer for complete details. If you’re interested in learning more about the College Student Purchase Program, feel free to contact us at your convenience or drop by D&D Motors at 13655 East Wade Hampton Blvd., Greer SC, 29651-6269. We look forward to serving our customers from Greer, SC, and throughout Greenville, Spartanburg and Upstate, SC!